Ned Lukacevic believes Fife Flyers are capable of the sort of run that took them all the way to last year's play-off finals - but he admits inconsistency is a huge frustration. The Kirkcaldy side lost at home and won away to Hull Stingrays in a weekend double header over the Humberside men. And forward Lukacevic, who scored the winner in Sunday's 3-2 win, isn't getting too carried away over the points they did pick up. "It's great to pick up the two points after a tough one on Saturday and we knew Sunday would be a must-win and, while we're pleased to get it, we've a long way to go," he said. "Inconsistency is a problem for us right now and it's frustrating when you consider we have a decent team. "As a club, we have a lot of belief and I think we are capable of going on a similar streak that took us to the play-offs last year, but we're not going to let the negatives get to us." 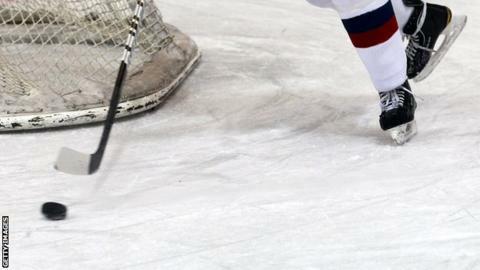 Todd Dutiaume's side went down 6-3 to Hull in Kirkcaldy on Saturday, despite threatening a third-period comeback. Jordan Mayer, Jordan Knox, Omar Pacha, Carl Lauzon and Zach Hervato all netted as the Stingrays romped into a five-goal lead without reply. Flyers hit back with Bobby Chaumont, Scott Fleming and Matt Reber as they finally showed signs of life in the third period, but Will Fredericks killed them off with a late sixth for Hull. Lukacevic and his team-mates made amends 24 hours later over Pacha's men, but there were moments of nerviness towards the end. Two finishes in the first period had Fife ahead as Matt Reber and Chris Wands both found the net to give Flyers an advantage. Lauzon pulled one back in the third session as Hull looked to get something from the game, but Lukacevic's goal seemed to settle things. However, Eric Galbraith notched Stingrays' second to make it a nervy finale, but Fife held on to claim the win. Edinburgh Capitals had only one game over the weekend, hosting Belfast Giants, but their winless run was taken into double figures as they were defeated 6-3 by the champions. Lukas Bohunicky and Dennis Rix had Richard Hartmann's side two up in the first period, but Evan Cheverie's finish pulled Belfast back into the game. Mike Kompon, Calvin Elfring and Adam Keefe put the Giants ahead, although Greg Collins hit back for the Caps, but Mark McCutcheon and Darryl Lloyd made sure with late markers. Braehead Clan ended the weekend five points clear at the top of the Elite League table despite not playing on Sunday, with their only game resulting in a win over Dundee Stars 6-2. Lee Esders opened the scoring in the first period before Ryan Kavanagh and Scott Pitt joined him on the scoresheet. Stars hit back through Paul Swindlehurst, but the home side surged further ahead through Leigh Salters, Derek Roehl and Stefan Meyer to ensure the win. Sean Ringrose pulled a late consolation back, but Clan had the points in the bag already by that point. However, Ringrose's contribution proved decisive on Sunday when the Tayside men won their third league game in four - edging out Sheffield Steelers 3-2 after penalty shots. Jeff Hutchins' side were 2-0 up either side of the first interval with goals from Igor Gongalsky and Kevin Quick, but Jeff Legue and Tyler Mosienko levelled to take the game to overtime. Stars goalie Marc Cheverie saved a Jonathan Phillips penalty shot in the extra session, but when the shots were needed to settle things, Ringrose's was the only one to succeed. Their recent wins have come despite being shorthanded and, while coach Jeff Hutchins looks for reinforcements, forward Bari McKenzie admits it's been a hard couple of days. "We're pretty tired and beat up, but we're working on regardless and I know the coach is trying his best to bring a couple of players in to help us out," said McKenzie. "The fact other teams around us lost on Sunday has helped as well. We just need to keep doing what we're doing and hope for the best."